I led a field trip to see among other birds the Bobolink and Dickcissel I found in Canon City this week. Wouldn't you know, they started mowing that hay field last night and the hay mower was on the field when we got there this morning. I had to work harder to refind the Bobolink and Dickcissel but did so after hearing their distinctive calls. 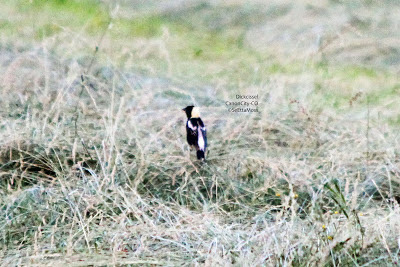 We saw both the male and female Bobolink as the female flew out of the hay when the mower got close. Sadly this likely indicates she was on her nest and waited to the last minute to flee. Yes, the contents of the nest-eggs and/or nestlings-are most likely destroyed. We only saw the male Dickcissel and he sang intermittently as his hay field was mowed around him.